Seen in the background, a simchah setting as displayed on the chasunah guidelines recently issued by Bobov-45. For all too many families, a time that by all accounts should bring the greatest amount of simchah comes with financial pressures that can not only create a challenging level of stress, but potentially threaten to alter the entire economic stability of a home. Over the past decade or so, some kehillos have worked to design approaches aimed at paving a path for parents to marry off children with dignity without it driving them into a cycle of debt and poverty. Many have developed gemachs to help shoulder expenses while working on ways to do away with unnecessary expenses and drive down costs for essentials. A little over two weeks ago, the Bobov-45 kehillah made an ambitious move towards helping to ease this increasing burden on its members with the unveiling of a set of chasunah guidelines. 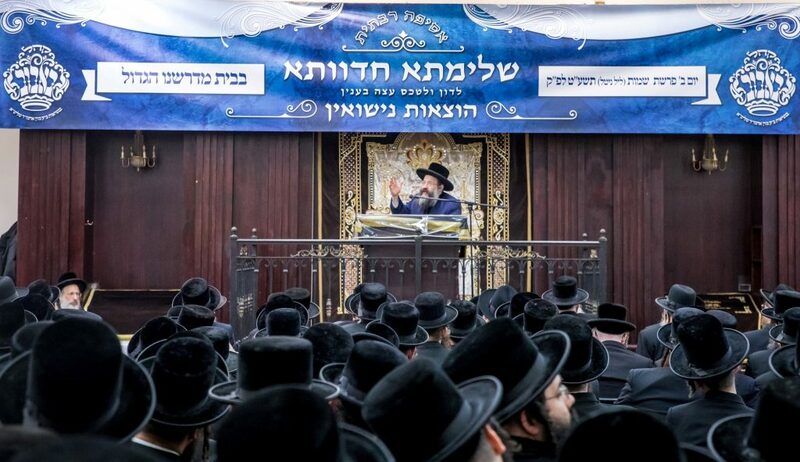 At a mass asifah of the Chassidus’ members, which drew participants from around the New York area and was broadcast via hook-ups to Bobov-45 communities around the world, the kehillah’s Rebbe, Harav Mordechai Dovid Ungar, shlita, addressed the importance of the new guidelines while putting what some might be tempted to view as “restrictions” in a different light. The gathering was held on the night of December 24, which some communities observe as “nittel.” One of the featured speakers at the event, Harav Ahron Yidel Gordon, a Maggid Shiur in Bobov-45’s mesivta who served as chairman of the event, used the date as a light-hearted springboard to illustrate how far trends of superfluous gift-giving during the engagement period can become, saying that soon mechutanim will feel compelled not only to give presents on Yamim Tovim, but to send their chassanim history books to read on nittel. Rav Gordon emphasized the point that has been at the core of the discussion on scaling back standards for chasunos for some time, that many practices that slowly drive costs up for families are in essence unnecessary and have become obligatory for little good reason. Bobov-45’s guidelines, aimed at acting as a reset button of sorts for chasunah-related expenses, adapted some moves from other kehillos that have tried to ease the burden on their members and introduced some original steps as well. 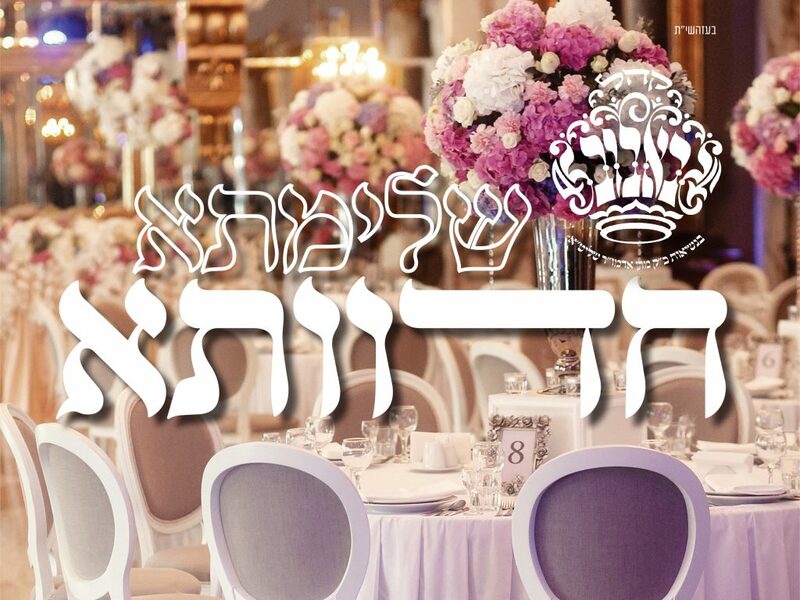 One of the more novel ones asks Bobov-45 Chassidim to forgo the celebration of a “tena’im,” a vort or engagement party of sorts that is ostensibly centered on the reading of the tena’im document. 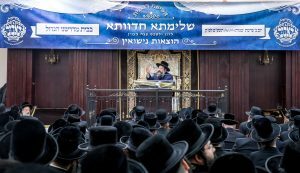 While the celebration has become highly standard in recent decades, those familiar with the history of the Chassidus say that originally the custom was to read the tena’im at the chasunah itself — as is the practice in most non-Chassidic circles. As such, eliminating the tena’im celebration is not an innovation, but merely a return to Bobov’s original minhag. Families are encouraged to hold only a small “l’chaim” at the time that the shidduch is completed, saving an estimated $5,000. Another unique idea designed to save both costs and stress is a call to send formal invitations only to close family and to those outside of the Bobov-45 kehillah, while those in the community will be informed of the details of the chasunah via a monthly newsletter that will contain images of submitted invitations. Other aspects of the guidelines focused on more standard approaches to lowering costs, including a call for the elimination of the most costly gifts such as a gold watch for the chassan and a diamond one for the kallah as well as encouragement to purchase the relatively low-cost “Kesser Malchus” model shtreimel for $1,500 as opposed to the many far more costly options on the market. Additionally, Bobov-45’s askanim spent countless hours negotiating with Boro Park’s Chasunah Plaza to design a package for basically all gift, houseware, and furniture items for new couples that would fit the community’s needs at the most affordable price they could agree on. The packages include all gifts for the chassan and kallah respectively as well as another shared package for the purchases aimed at starting a new home, ranging from coffee mugs and a rolling pin to a breakfront and bedroom set. Those involved estimate that those who take advantage of the package deals will save between four and five thousand dollars. For many years, Bobov-45 has operated a system to give grants of $10,000 to mechutanim who were not able to afford the costs of marrying off their children on their own. As a means of encouraging the tzibbur to adhere to the new guidelines, the maximum amount given has been increased, but is now incrementally tied to observing each of the procedures now being recommended by the community’s leaders. For example, a family willing to forgo holding a tena’im is eligible to receive $2,500 from the keren, another $2,500 for not giving a gold watch, another $2,500 for using each of the Chasunah Plaza packages and so on, for a potential total of $12,500 per side. One other main component of the recommendations is a package for the chasunah night itself of services including a band, singers, floral arrangements and photographers that can be used in any simchah hall chosen. Those involved in the effort have estimated that families of chassanim stand to save $21,500 and those of kallos $16,500 by following the guidelines, aside from the funds they stand to receive from the kehillah’s gemach. The new program has been entitled “Shleimasa Chedvasa,” a complete celebration, a term borrowed from the zemiros the Arizal composed for each of the seudos Shabbos. At the asifah, each attendee received a detailed brochure with breakdowns of each step of the guidelines, the packages available, and a colorful spreadsheet showing how and where savings will be accomplished. Yisroel Dov Bernstein, one of the askanim heavily involved in planning Shleimasa Chedvasa, said that the push to make the changes largely came from younger families in the community who foresaw the economic difficulties they would face when the time came to bring their own children to the chuppah. “They’re looking ahead and asking themselves, how are we ever going to afford this when we can barely pay the bills to make bar mitzvahs,” he told Hamodia. In addition to the mass gathering, drashos were delivered in Bobov-45’s yeshivah and high school for girls to impress on those who b’ezras Hashem will soon be chassanim and kallos themselves the importance of accepting the new standards the kehillah is attempting to set, emphasizing their pivotal role in achieving what could be of incalculable help to so many families. Mr. Bernstein said that the group of askanim developed the new program after extensive meetings with members of the community as well as stakeholders, first and foremost the owners of Chasunah Plaza and other service providers. He said that they had approached the matter with three goals in mind: heightened awareness of the problem, an attempt to stop costs from rising, and to lower expenses as much as possible. Based on the feedback he and others involved had received so far, Mr. Bernstein said the response had been overwhelmingly positive.